UBS on active management: myth busters? Browse: Home / 2017 / November / UBS on active management: myth busters? It has again been a very long time since my last post. Sorry again. But I have now decided that it might be fun to get involved in the ongoing discussion over the merits of active management, particularly since so much of it is self-serving nonsense — incidentally on both sides. UBS has now weighed in with its defense of active investment. In a recent paper, the bank calls the superiority of passive investment a myth and claims that, on average, active funds have outperformed both their benchmarks and passive funds. This result contradicts decades of academic research but, if true, would obviously be very good news for the beleaguered active management industry. But is it true? Given that investment in any market is largely a zero sum game before fees for all investors taken together, somebody else would have to underperform if active funds are to outperform,. UBS claims to have found the main victims: direct investors, i.e., those not investing via UCITS or mutual funds. But direct investors are a very heterogeneous group. UBS has chosen to focus on retail investors to whom they assign most of the blame for the underperformance. But institutional investors such as hedge funds and insurance companies are also part of this group and it is not obvious why their performance should be worse than that of active funds, particularly since their portfolios are often managed by the same investment teams that also manage funds. Finally, direct investors also include stakeholders, those long-term strategic investors whose holdings are often excluded from the free float-based indices. In many markets, stakeholders are the single largest group of investors in equities (the US are an outlier in this respect). Since they usually hardly trade at all, they behave more like passive investors, except with a much more concentrated portfolio. Again, it is not obvious why they should do systematically worse than other investors, as a group. Paradoxically, UBS recently published a study on family-dominated firms that suggested that family firms tend to outperform. Family firms are, of course, the most obvious stakeholder dominated firms (I am being somewhat opportunistic here since I do not fully believe the results of that other UBS study either). Thus, there is really no evidence that institutions and stakeholders underperform relative to funds and there are not enough retail investors left to drag down performance in a meaningful way. Consequently, there is no obvious counter-party that can provide the required underperformance to allow active funds to outperform. This still leaves us with the task of finding an explanation for the results of the study. UBS insists that they have taken great care to use the funds’ actual benchmarks in their analysis in contrast to other studies that force a standard benchmark on all funds. But a fund’s benchmark is not necessarily fair or even reasonable. There are obvious incentives for funds to choose inappropriate benchmarks. Bill Gross, while at Pimco, routinely used a (low risk) US government benchmark for his funds, even though his investment universe was much broader and included higher risk assets such as high yield and emerging market debt. Not surprisingly, his performance relative to his benchmark was often rather good. But even though he insisted on calling it alpha, he simply harvested a series of additional risk premia. In order to be fair, a benchmark should include the entire investment universe of a fund whenever possible (and even then we should beware of systematic style biases). Most standard equity benchmarks do not cover the entire market; they are biased towards large cap stocks; smaller companies are mostly excluded. Also, within a cap weighted index, the largest constituent may be ten or a hundred or more times bigger than the smallest constituent. But managers of active funds tend to be much closer to an equal-weighted portfolio, with relative position sizes ranging from, say, one to five times. That means that whenever a smaller index constituent is included, it tends to be overweighted. Many managers also include smaller stocks outside the benchmark. This combines to give many actively managed portfolios a small cap bias. Certain managers actively seek out small cap stocks, believing that they represent a less efficient part of the market, giving them a better chance to add value. This is a well known, well documented, fact. We find that whenever small caps in a market outperform, the proportion of active managers of large cap funds that outperform their benchmark tends to soar. We can get an indication of how that fact applies to the UBS study by using the data in their Figure 27. It shows the year-by-year outperformance of active funds (ex US/Global) relative to passive funds for the 2001 to 2016 period. Lacking more precise information and based on the description of the sample given in the study, I assume that ex US/Global means mostly funds invested around a European theme. Therefore, I compare this outperformance (reading off the graph) to the outperformance of the MSCI European Small Cap Index over the standard MSCI Europe Index (the small cap premium) in the same year (see graph below). I only have data since 2003, which gives me fourteen data points. The results are quite striking. There is a clear positive relationship between the observed “outperformance” and the small cap premium. 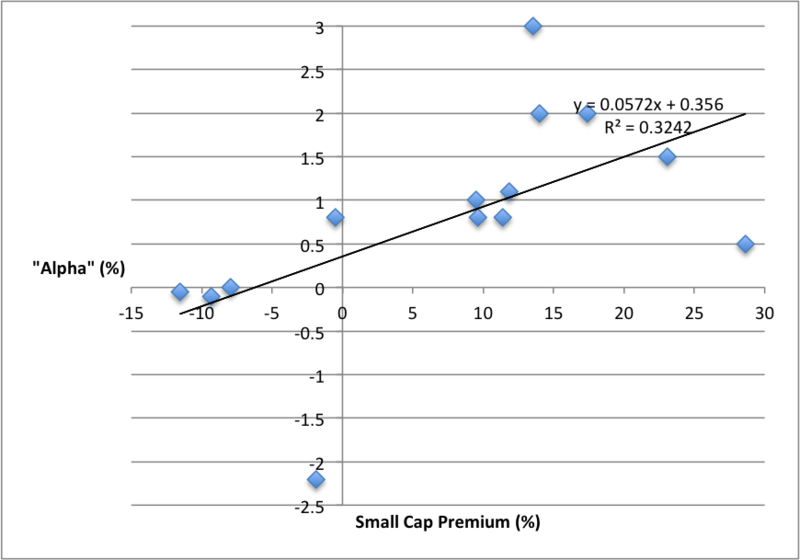 The R squared suggests that a substantial part of the “alpha” is linked to the small cap premium. Taking the regression line as a point estimate, we find that by adding about six per cent of the small cap index to the passive funds, we could have achieved the same return as the active funds. In my experience, the small/mid-cap content of active large cap funds is typically rather larger. In other words, the outperformance is likely to be not alpha but at least partially the result of a misspecified benchmark. The study raises a number of interesting points but it arrives at its convenient conclusion too quickly. More, and more serious, work will be required to analyse their results. There are simply not enough poorly informed investors foolish enough to provide an aggregate alpha to the active fund management industry that is positive. It is understandable that active managers would like the study to be correct; they would much rather argue that the industry as a whole adds value than having to argue that they are among the exceptions that outperform. Incidentally, even if the results of the study were correct, betting on an active manager without further information is still not a worthwhile bet. Their figure 12 shows that their claimed 0.42% alpha is associated with a 8.34% volatility, i.e., if I simply pick an active manager more or less at random, I have a significant chance to experience a big loss or gain. To make active management attractive, we must know much more about an individual manager’s prospects. Wishful thinking about the performance of the industry will not do. Glad to see you are still publishing. It is argued – not by active managers alone – that if everyone were to switch to passive investing there would be no investor driven pressures on managers to maximize outcomes at their individual enterprises and for that reason active managers as active and often activist shareholders are important to the overall health of markets. Wadih, true but we are not quite there yet. Also, you are not saying that investors should invest in active products regardless of return in order to save capitalism? No I am not at all saying investors should invest regardless of return to save capitalism. I have my own opinions about the variety of effective ways in which shareholders can and do motivate management. I have seen far too many cases where so called active managers do nothing that I regard as useful to elicit superior performance at the firms whose shares they own. I was just interested to know your own thoughts on the debate. indeed nice to hear from you again via this blog and to see other old friends comment. Back in 1997 at McKinsey & Co, I had the good fortune to be a lowly associate involved in looking at exactly this issue when it was not yet at vogue with the result that roughly 99% of all active fund managers underperformed the markets over a 7-10 year period…leaving only 1% who are in your words if I remember them correctly either “lucky fools, or indeed geniuses.” For anyone to really be able to weed those out and think one can do so would surely be foolish…or at least be a more costly undertaking relative to using benchmark ETFs. In the past 20 years, investors and the tools at their disposal have grown increasingly sophisticated (think high frequency trading, access to information), that I would think that 1% has by now shrunk to basis points, not percentages. In the past 15 years, I really have only seen two funds that consistently outperform the overall US market – and both of those are very unique and highly complex strategies that have nothing to do with pure equity! It is always interesting though to see how particularly those banks that have failed most spectacularly at active management continue to keep pushing the same mantra – therefore, I very much enjoyed reading your comments.